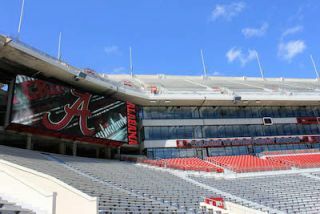 The University of Alabama's Crimson Tide–among the most storied college football teams in the nation–plays all of its home games at 100,000-plus seat Bryant-Denny Stadium in Tuscaloosa. Pleased with the authoritative performance of its on-field sound reinforcement system, a single Danley GH-60 Genesis Horn paired with a single Danley TH-212 subwoofer, the university agreed with design and installation firm Baker Audio Visual of Norcross, Georgia that Danley Sound Labs loudspeakers and subwoofers should replace the existing sound system to cover the entire stadium. Constrained by an aggressive timeline that necessitated reusing existing hang points, Baker AV installed Danley's new SBH-10 column loudspeakers at both end zones, Danley's new weatherproof OS-80 loudspeakers and OS-115 subwoofers in the upper bowl, and Danley's seasoned SH-96HO loudspeakers (with additional OS-80 loudspeakers for down fill) in the lower bowl. Baker AV installed Danley's new SBH-10 column loudspeakers at both end zones, Danley's new weatherproof OS-80 loudspeakers and OS-115 subwoofers in the upper bowl, and Danley's seasoned SH-96HO loudspeakers (with additional OS-80 loudspeakers for down fill) in the lower bowl. "We only had a short window to complete the design and installation once the athletics department gave us the go-ahead," said Joe Schuch, vice president of Baker AV. "We had a similarly short window at Turner Field, home of the Atlanta Braves, where Danley Sound Labs delivered over four hundred custom loudspeakers within six weeks to make that job a success. At Bryant-Denny, we worked with Mike Hedden, Danley president, on a solution that would work within the constraints of the existing infrastructure. There was not enough time to engineer new solutions or to modify loudspeaker locations. We worked through Danley's catalog of form factors to build an appropriate solution." In part because Danley builds all of its loudspeakers and subwoofers in the USA, it was able to meet the deadlines at Bryant-Denny while simultaneously meeting deadlines at the Kentucky Derby's Churchill Downs. Hedden reported that, between the two, the company produced between four and five hundred loudspeakers in just four weeks. Overall, the old–and thus new–sound reinforcement system consists of three areas in a fully-distributed design: the end zones, upper bowl, and lower bowl. The old end zone systems held fourteen line arrays perched atop fourteen 36-foot poles, four line arrays elements to a pole. Servicing those units had always been problematic, as they could not be safely approached from the seats and thus had to be serviced from the ground below–nearly two hundred feet down. The Danley Sound Labs replacement is smaller, lighter, and lower, yet it delivers better coverage and fidelity. Each pole now holds a single Danley SBH-10, which is Danley's new column form factor, for a mere fourteen loudspeakers total. Each SBH-10 hangs at a 45-degree angle and rakes the seats going down. Importantly, each SBH-10 is much lighter than the four line array elements it replaces and is mounted only eight-and-a-half feet above the seats, allowing it to be safely serviced from the seats. The upper bowl now gets coverage from forty distributed Danley OS-80 weatherproof loudspeakers (two at each of twenty locations), which will remain impervious to the elements for decades to come. Every other OS-80 cluster is paired with a Danley OS-115LF weatherproof subwoofer for low-end support. The lower bowl uses twenty-four clusters, each comprised of a Danley SH-96HO for main coverage and a Danley OS-80 for downfill directly below the speech word intelligibility. Similar to the end zones, all of the Danley products in the upper and lower bowls deliver better coverage with substantially fewer and/or lighter boxes, making it possible for Baker AV to install the system without taking valuable time to recertify the hangs.